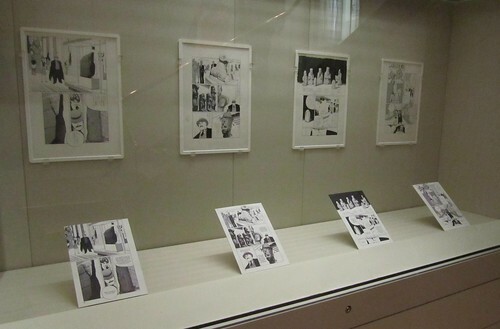 While visiting the Manga at the British Museum – Drawings by Hoshino Yukinobu exhibition at the British Museum yesterday I frequently heard people asking each other “what’s manga?”, and so I will begin this post by answering that question. In the words of Nicole Coolidge Rousmaniere, “Manga, which we might translate playfully as ‘pictures run riot’ is a visually compelling medium that engages the reader in a uniquely effective manner through a combination of pictures and text.” In other words, manga is the word for Japanese comic books. Despite my love for Japan, I’ve never been much of a manga reader. I appreciate the art form, but have always felt I would rather read “real books”. However, I’ve just found the book that may have changed my mind forever. In a mere 264 pages, I believe I could be a convert. Professor Munakata’s British Museum Adventure (The British Museum Press) is a compelling, page-turning read. Even if you have never read a comic book, or think comic books are for children, I wholeheartedly recommend this book and am sure you won’t be disappointed. The artwork is stunningly detailed, and this book not only looks good, despite its minimal colour, it feels good too. The pages have a lovely, tactile, matt finish, which makes the book a pleasure to hold. 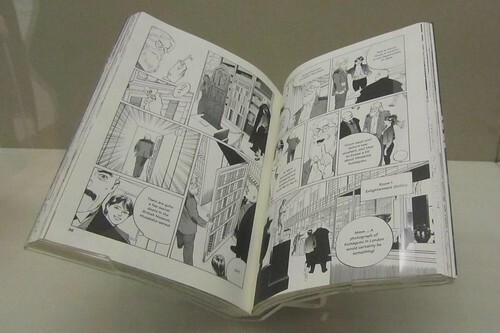 Hoshino Yukinobu, the artist and writer of Professor Munakata’s British Museum Adventure, first published a manga in 1975 (Iron Queen) and went on to win the prestigious Tezuka Osamu Prize for his manga Distant Morning. Hoshino’s Professor Munakata character first appeared on his own in his Case Records of Professor Munakata, which won the top prize in the manga division of the Japanese Agency for Cultural Affairs twelfth Media Arts Festival. A unique characteristic of Hoshino’s work is the way in which he incorporates actual historical or mythological events into his stories, alongside the fiction he creates. 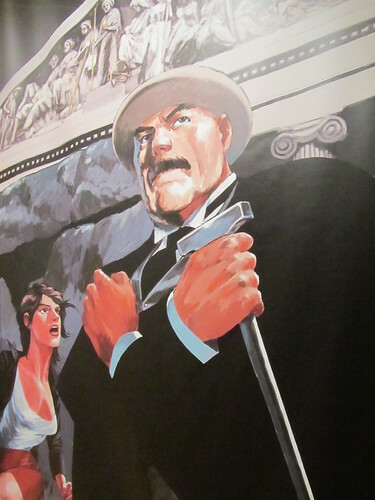 After choosing to focus on the character of Professor Munakata (a professor of Ethnology and Folklore at the fictitious Toa Bunka University in Tokyo), his adventures were serialised in Big Comic (a popular manga magazine), and even turned into TV dramas. 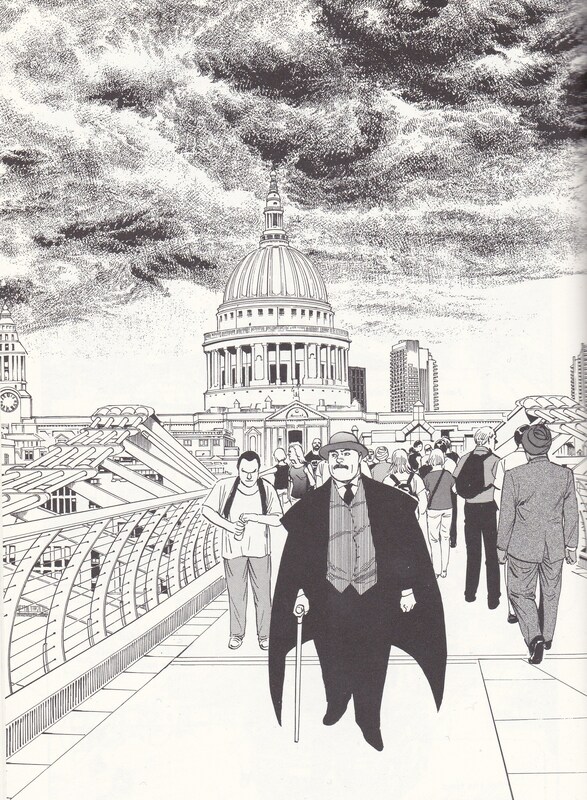 Hoshino clearly spent a lot of time researching and taking in the sights of London during his two visits to the UK. All of London’s major landmarks (Westminster, St Paul’s Cathedral, the London Eye and, of course, the British Museum, to name a few) are depicted beautifully and in such detail that I often felt like I was watching a live-action movie as I read the book. Hoshino’s research sounds intense, and one might think that, when creating a comic book, it doesn’t really matter what sound a police car makes in London. However, it does. A characteristic of manga is that they are often full of sounds, usually shown in katakana. 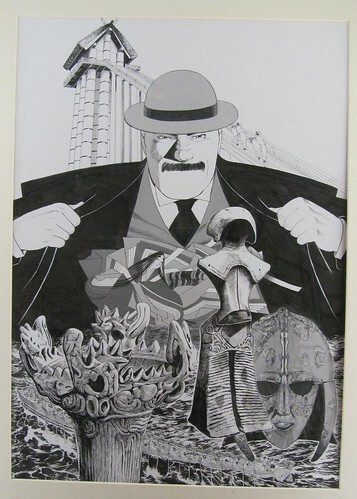 Although the text in Professor Munakata’s British Museum Adventure has been fully translated into English, the decision was made to keep the sounds in their original Japanese (they are part of the art work). A full list of sounds, indexed by page, can be found at the back of the book, including the ファンファンファン (fan fan fan) of the police sirens and the バババ (bababa) of the helicopters. 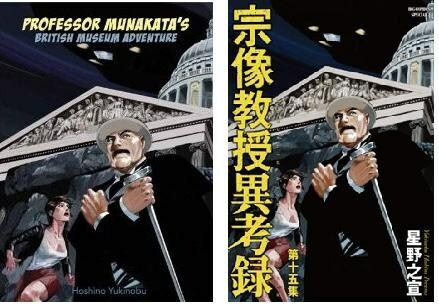 The edition of Professor Munakata’s British Museum Adventure on sale in the UK is a translation of the original Japanese, but the Japanese format has been kept; the book is read from back to front, right to left. It took me a moment to get the hang of reading a book in this way, but I soon got used to it and found it very easy to adjust. As well as the useful katakana list of Japanese sound effects, the book also includes a forward by the British Museum’s Director, Neil MacGregor, an introduction and interview with Hoshino by Research Director at the Sainsbury Institute, Nicole Coolidge Rousmaniere (who worked with Hoshino throughout the creation of the book, and is widely believed to be the inspiration for the character Chris), and an essay entitled From Ukiyo-e to Manga: Japan’s Mischief-making Print Culture, by Timothy Clark, head of the Japanese section in the Department of Asia at the British Museum. The book, Professor Munakata’s British Museum Adventure (ISBN 978-0-7141-2465-0), by Hoshino Yukinobu is available from the British Museum shop in London and their online bookstore for £14.99, which is a bit of a bargain, I think. In Japan, the book is published by Shogakukan, who also publish Big Comic. The exhibition, Manga at the British Museum – Drawings by Hoshino Yukinobu, is on until April 8th (in room 91) and is free to enter. For more information about the British Museum, please visit their website: britishmuseum.org. This sounds like great fun! I really enjoy manga that take historical events and make them fun or interesting- of course, I do end up reading a lot myself since I review them ^.^”. This is something that I’ll have to get into once I finish Me and the Devil Blues (American myth and legend as manga? Couldn’t resist! ).